My name is Laura. I'm 16 and my favorite ice cream is Moose Tracks. I chose Three Little Words. The librarian at my school showed me a stack of books she was recommending to students. It sounded like it would be a good book so I asked for it for Christmas. What was your favorite part of this story? When the little girl finally finds a family and is loved and can live with her new family forever. If you had a problem similar to the main character's problem, what would you do? Hmmm, that's really hard. I would just keep my head up and hope for a good family one day. It’s an easy read, but you get a lot out of it in the end. It’s easy to connect with the main character. Originally, I needed a book for a project, but I ended up reading this book because it was so interesting. I don't like to read all that much, but this book was true and I had to find out what happened to the girl. Once I got started, I couldn't not finish reading it. Because it was real, I had to know what happened to this real human being. What do you think about the book's cover? It’s a picture of the little girl – a real picture. In the book, the author tells the significance of this picture. Would you want to read another book about these characters? Why or why not? Yes, just to see what her life was like after she was adopted. The last pages said a little about how the author turned out, but I'd like to know more details. Can you name another book that reminds you of this one? Out of My Mind has a similar theme in that both main characters have a struggle that no one can understand and they have to find a way to overcome it. If you could ask the author one question about this book, what would it be? How did you cope with all of the different living conditions before you found your family? I reached out to the author, Ashley Rhodes-Courter, and she was so kind to give an answer to Laura's question. I spent so much of my early life feeling like I was unwanted, worthless, and unloved. It was hard to be bounced around to so many different strangers, not knowing how long I would be in any one placement. I had to force myself to focus on other things--like school, projects, taking care of my little brother--but sometimes I would just shut down completely to protect myself. Eventually an adoptive family helped me break down the walls I had built and taught me that some people can be trusted. 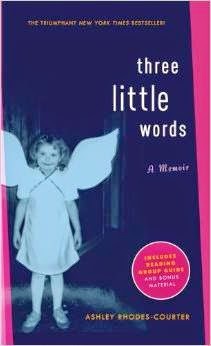 Today, I am lucky to have so much love in my life and I recently submitted my second book, "Three More Words" which picks up where "Three Little Words" left off. I hope that my story and outcome can inspire others that may be going through difficult times.